While out gardening in our front garden last week we saw a wonderful net casting spider. It is amazing how it is holding the net ready to drop it on any small insect which looks like a tasty lunch. 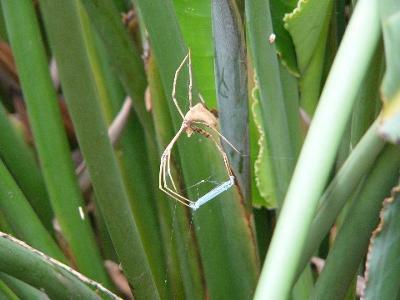 The prey-catching method of net-casting spiders is unique. At night they build a rectangular, postage-stamp-sized web, made with wool-like, entangling silk threads. They then carefully aim a few small splodges of droppings, which are a bright white colour, onto the surface just below them, such as a leaf or branch. They use these spots as a prey-sensing system. The net-casters hang head-down holding the corners of their snare-web in their front legs. When they see a wandering insect pass over the white target spots, they lunge downwards with the snare and entangle the victim in it. The spiders then wrap extra silk around their struggling catch and bite it, injecting poison and digestive enzymes. Net-casting spiders catch beetles, ants, crickets, spiders and even moths in flight. Net caster on the net! I have never heard of the Rufous net Casting spider and am impressed by your photo. Catching it casting would have garnered you a 5 star rating.